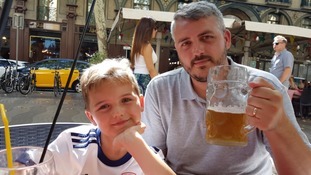 Sedgefield family: "It could have been us"
Catherine Young who lives and works in Barcelona says she was only 10 minutes away from the scene of the attack in the Spanish city. Scarbrough student describes the moment terrorists targeted Barcelona. Kiera Birkenshaw was with her boyfriend Kyle from Middlesbrough. Vueling Airlines has launched the first of four flights from Newcastle International Airport to Barcelona over the festive period. Arriving under a traditional water cannon salute, the Spanish carrier is offering the chance to discover the capital of Catalonia this Christmas and New Year, before returning with a summer service in March. We are delighted to welcome Vueling Airlines to Newcastle Airport. This new service offers extra choice and more opportunity for passengers looking to travel to Barcelona and beyond.> Vueling's extensive route network allows through-ticket connections to onward Spanish destinations such as Bilbao, Ibiza, Madrid and Seville."